For quite a while now we've been receiving reports that a new 928 is coming. To which we have always said "Boo Ya!" with the right side of our mouth, and "yeah right" with the left. Up until today the word on the street has been that after the four-door Panamera launches in 2009, they'll begin hammering on a two-door version due out in 2012 or so. Well guess what? A janitor spy deep within Porsche is claiming that a two door Panamera has been in the pipeline the entire time. Seems that Porsche has been keeping a close eye on the Bentley boys and their two-headed Continental GT/Flying Spur monster. Though, unlike the German British two-door, the new 928 (can we just go ahead and call it the 928?) will be all about über performance, not waftable GT luxury. 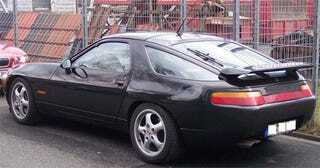 Seeing as how Porsche and VAG are as inbred as a racehorse, might be the only way to sneak a new 928 into production. Put us down for the twin-turbo V8 version please. And, if they drop in the V10 from the Carrera GT, we'll take two. And for the love of the fatherland, make it look like the old 928.